This is quite an insight about the teen-aged John Lennon. 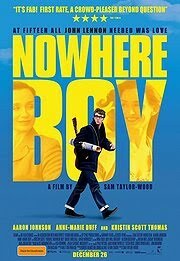 The film covers three short years but has a lot to say about the troubled life he led before he became famous as one of the Beatles. There are excellent performances from the three principals and lots of rock ‘n’ roll. As with many British films, the f-word is used with abandon. for language and one scene of sexuality. Seen from John’s perspective Julia offers her left cheek for a kiss but in the side view it is her right cheek being offered.